A shiny black baby-grand piano basking in the living room sunlight. Musty, oversized wing back chairs. Dorothy, her childhood friend and lifelong companion. A black and white checker-board tile floor. An entire wall of shelves loaded with books in a continuous state of being read and re-read. Bulky orthopedic shoes and clanky, metal leg braces to counteract the paralysis polio had inflicted on her when she was 17 months old. In 1925 Franics graduated from Western Reserve University and began teaching at Notre Dame College in Cleveland. According to one of her students, “Miss Q quickly established a reputation as a demanding teacher. Her deceptively simple questions unsettled and challenged students. They could not simply take copious notes and regurgitate facts. “Quinnie” expected them to develop into independent thinkers who could spot shallow reasoning and defend their own beliefs.” I have no doubts this is a completely accurate description. Francis completed her Ph.D. in English literature at WRU in 1947. One year later she was named head of Notre Dame’s English Department — a post she held until she retired in 1970. I don’t think Francis had much patience for small children, but as I got older, visiting Hollister Road became more and more interesting for both of us because of the long, far-ranging conversations we shared… mostly about literature, her travels and her teaching. I think Francis and I really hit our intellectual stride once I began attending Kenyon College and declared my major in English Literature. In four years, seldom a break from school went by that didn’t include a trip to Hollister Road. 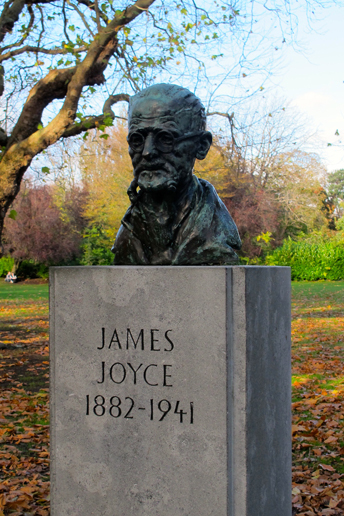 During one of these visits we discussed the Irish writer, James Joyce. She was thrilled with my enthusiasm—an enthusiasm fueled by an incredible Joyce seminar I was taking with a fabulous professor—and the beautiful girl I was falling in love with who sat next to me in the class. As the afternoon sunlight waned, Francis instructed me to go over to a particular spot on the bookshelf and find her copy of Ulysses. I couldn’t find it at first. Then I realized that the two unassuming grey volumes in a plastic bag(?) was what she wanted. I handed them to her where she sat with her aluminum walking cane leaning against the chair. Carefully… reverently she opened the bag and took out the two books: 1st edition Odyssey Press publications in perfect condition. She handed the historical pages over for my inspection. “I smuggled those out of Ireland in 1932 myself,” she said. “If U.S. Customs had caught me bringing them into the country it would have been a criminal offense.” I could barely comprehend the historical significance of what I held in my hands. The last time I visited Francis she was living in a retirement community near Cleveland’s “Little Italy.” Her beautiful residence on Hollister Road had been replaced by a single cozy room. I lay a sleeping baby Liam on her bed and we talked about my freelance travels and work. As the bustle of activity in the hallway signaled dinner time, Francis instructed me to go to her bureau, open a drawer and take out the bottle of whiskey that was secreted away under some pillow cases. “Are you sure this is OK?” I asked her. ﻿After Francis passed away my Aunt Mary informed me that she had a “box of stuff” for me to pick up next time I was in town. Little did I know. 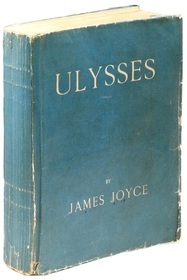 Amongst the leather-bound volumes of Yeats poetry and some other books was a plastic bag with two gray volumes in it: Ulysses. “Oh my God,” I muttered. 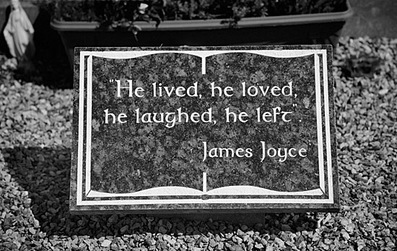 After all that, The Happy Medium Song of the Day is “Looking for James Joyce Grave” by Belfast’s Andy White. Fluntern Cemetery is where you need to be looking, Andy — apparently within earshot of the lions in the Zurich Zoo.